Most safety-conscious people use Time Machine or other backup software. However, in the event of a full hard drive crash, getting up and running using Time Machine can be time consuming – you'll need to restore OS X first, then use Time Machine to restore the rest, since Time Machine can't access system and other files in use during backups. Alternative backup programs, such as Carbon Copy Cloner, can create copies of your entire hard drive, but require that you boot from another drive. 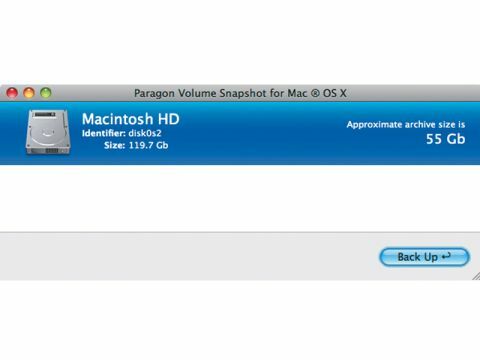 Paragon's Volume Snapshot for OS X claims to be the first Mac software to use snapshot technology to create a fully bootable image of your hard drive, even when you're running applications and software. It will create a snapshot of each file on your hard drive and copy that to a DMG file that your system recovery DVD can use to restore your drive. It also claims it can do so at up to 1GB per minute. Our first experience with Volume Snapshot wasn't pretty: the installer hard-froze OS X. However, once installed, it was very simple to use and created a bootable image of the hard drive. The 1GB/minute speed advertised was nothing like what we got – it took two hours to create a 42GB backup of 60GB of data. But that's it. It doesn't have any scheduling or incremental backup functions, or any of the other facilities of Time Machine and other tools. Given the options available in other, cheaper tools, this shouldn't really be a first choice for backups.